Serratia is the genus name of a group of relatively common bacteria, the most common of which is Serratia marcescens. There are other species within the genus, a few of which have on rare occasion caused disease in humans, but the vast majority of infections with the Serratia occur with Serratia marcescens, and from this point forward, any mention of Serratia is understood to refer specifically to S. marcescens. 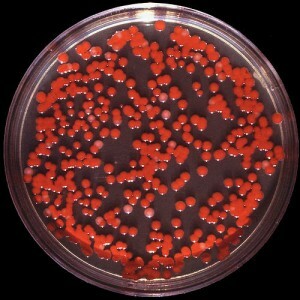 Serratia is widespread in the environment, especially in wet areas. Until the 1950s it was thought to be harmless and was used to study airflow because it was easy to track due to its pigmented nature. In fact, it was used by the military to study the possible airborne distribution of bacteria in a biological warfare attack. Serratia was intentionally released in the air over San Francisco and shortly thereafter, there was a marked increase in the reported number of cases of urinary and respiratory tract infections. This wasn’t the final clue marking Serratia as a potential cause of human disease, but it was a start. Serratia is what is most commonly known as an opportunistic pathogen in that under normal circumstances in an otherwise healthy person, infection and disease is uncommon. However, amongst those who are immune compromised due to illness, age, or treatment for some other medical conditions, such as some cancers, Serratia can cause potentially serious, even fatal, infections. Unfortunately, because Serratia is so commonly encountered in the environment, it is also a common cause of infections acquired by hospitalized people, a type of infection known as nosocomial, meaning the infection was acquired in a healthcare facility. Usually this happens to people who have been hospitalized for long periods of time and/or amongst those who have had invasive procedures, especially catheterization, intubation, surgery, or treatment with infected medical devices. In one case, the source of the infection proved to be artificial fingernails being worn by a surgical nurse. The artificial nails were causing micro tears in the sterile gloves, exposing the internal organs of surgical patients to the bacteria carried on the nails from residue of infected hand cream. The Serratia organism, of the same strain found to infect multiple patients, some of whom died from the infection, was found on the nurse’s nails and in her hand cream in her home. Serratia has also been identified in supposedly sterile, closed package medical consumables such as heparin flush syringes. This entry was posted in Bacteria, MRSA Home and tagged bathrooms, body fluids, gyms, healthcare settings, household, odor, pathogens, physical therapy, red, Residual Disinfectant, respiratory, scent, urine.